At first glance, a malfunctioning switch may seem like a small nuisance. You may think of light switch replacement as an easy DIY home improvement task, but it can quickly escalate into a very frustrating situation. The cause of the problem might not be clear, and it could be a sign of a more serious problem in your home. As a result, you end up wasting a lot of your time and resources on a single switch. You could even end up electrocuting yourself in the process. Don’t waste your precious time. Get the job right the first time! Let a professional Burbank electrician handle your light switch replacement service. Whether it’s a large scale project or small electrical repairs, we always follow a specific protocol that lets our electrician do their job professionally and efficiently. When it comes to light switch replacement, you can be sure that the job is getting done correctly, safely, and in a short amount of time. Markey Electric and Solar offer light switch replacement services for residents of Burbank and the surrounding Los Angeles area. If your home still has those plain boring “on/off” light switches, it’s time to consider upgrading them to something more functional. 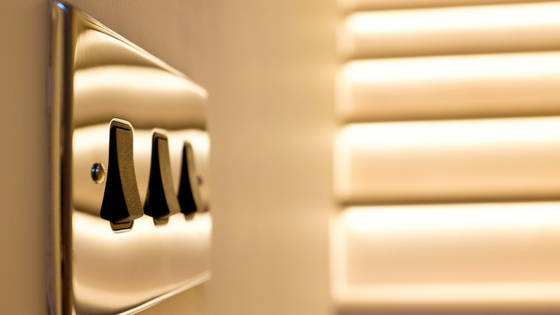 Modern light switches allow you to have more control of the lighting inside your home. They also make your use of electricity more efficient. Dimming your lights just a notch can save you on your monthly electric bills. Consider adding dimmers to different areas like your living room, dining area, and bedrooms. Light dimmers can also enhance the mood of an entire room.